Cottage on South bank of Torrens, near Morphett Street, residence of W.H. Campbell the Parklands Ranger. Cottage situated on the south bank of the River Torrens, a few yards west of Morphett Street Bridge. The cottage was demolished about 1910. Note on the back of the photograph states "Cottage on south bank of Torrens near Morphett Street. Identified by Mrs FC Finney as the residence of WH Campbell, Park Lands Ranger. Cottage situated on the south bank of the Torrens, a few yards west of Morphett Street Bridge. Mrs Finney is a step daughter of WH Campbell and lived in the house in the eighteen nineties. For exact site see C 271. Photographed about 1905. According to Mr E Brown, hairdresser of Hindley Street. 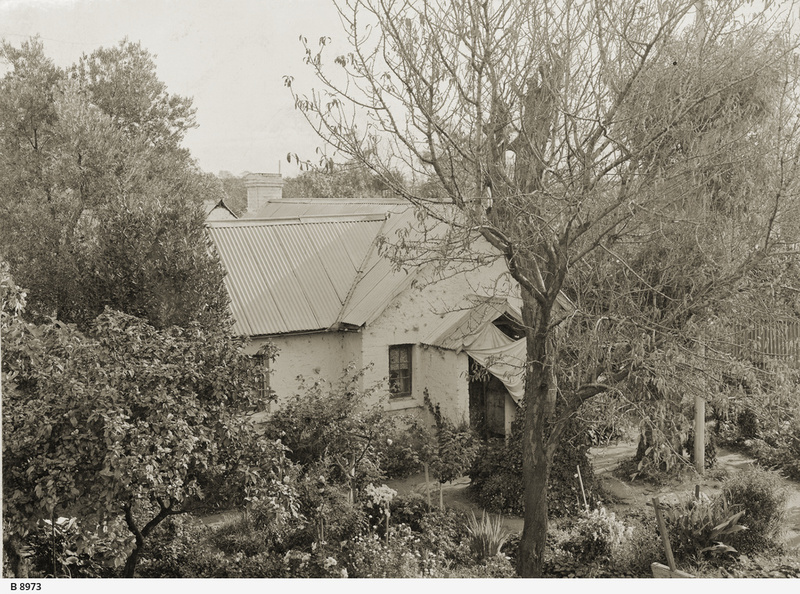 The cottage was demolished about 1910" The photograph shows a whitewashed cottage with an iron roof surrounded by a well established garden of fruit trees, flowers and shrubs.